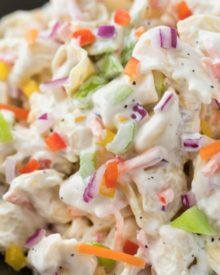 Perfect for summer bbq’s and picnics, this creamy pasta salad is made with tortellini instead of traditional dried pasta. Rainbow colored vegetables are tossed with the pasta and a deliciously sweet and tangy dressing! 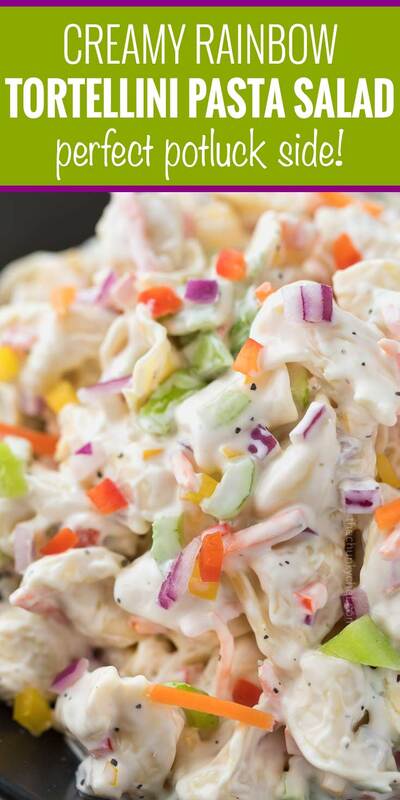 Step aside from traditional pasta salad recipes and give this creamy tortellini salad a try! 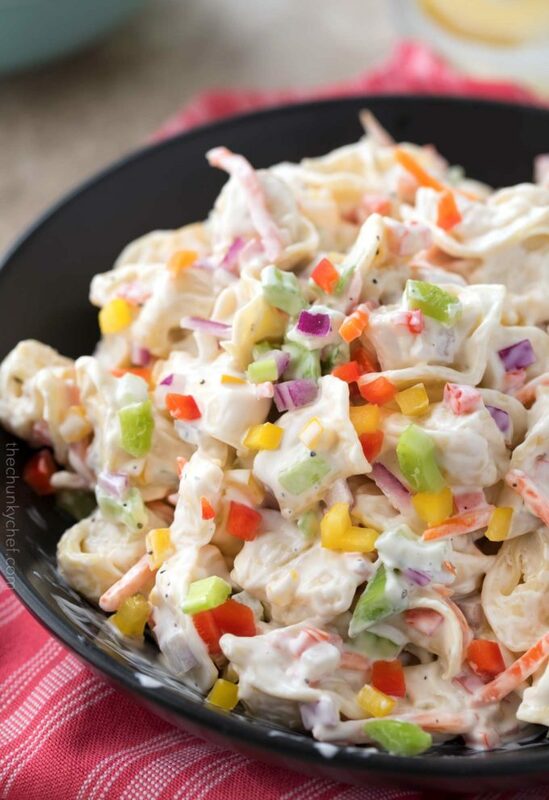 It’s very similar to what we in the Midwest call macaroni salad, with a sweet and tangy dressing… but this rainbow version is full of brightly colored vegetables and is made using cheese-filled tortellini instead of elbow pasta. 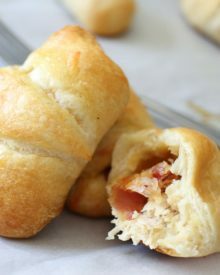 Trust me, make this for your next cookout or summer bbq and everyone will be asking for the recipe!! We’re headed into one of my favorite seasons. Not Spring, not Summer… but even better… cookout season!! There’s something so magical about family and friends gathered together, food is sizzling away on the grill, a warm breeze is blowing softly, freshly cut grass can be smelled, and a table full of glorious side dishes awaits! 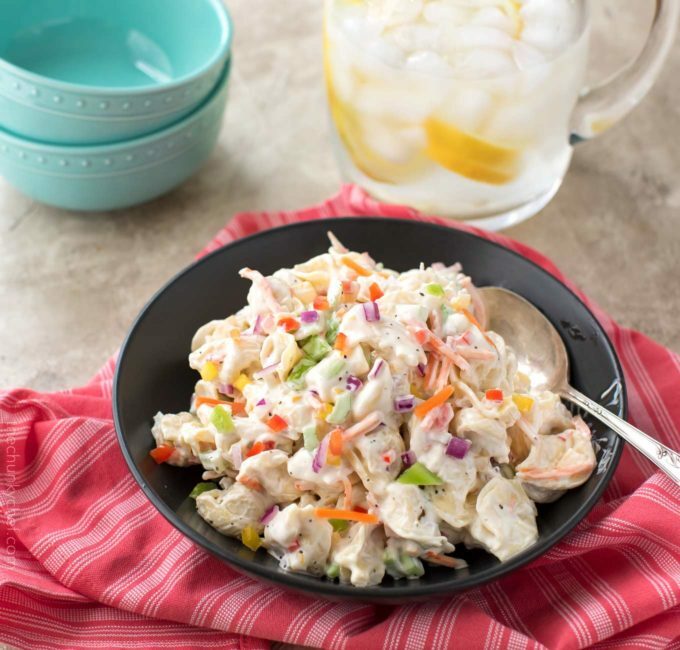 There are SO many fabulous cookout side dishes… potato salad, corn on the cob, broccoli salad, Mac and cheese, baked beans, and one of my favorites, macaroni salad! 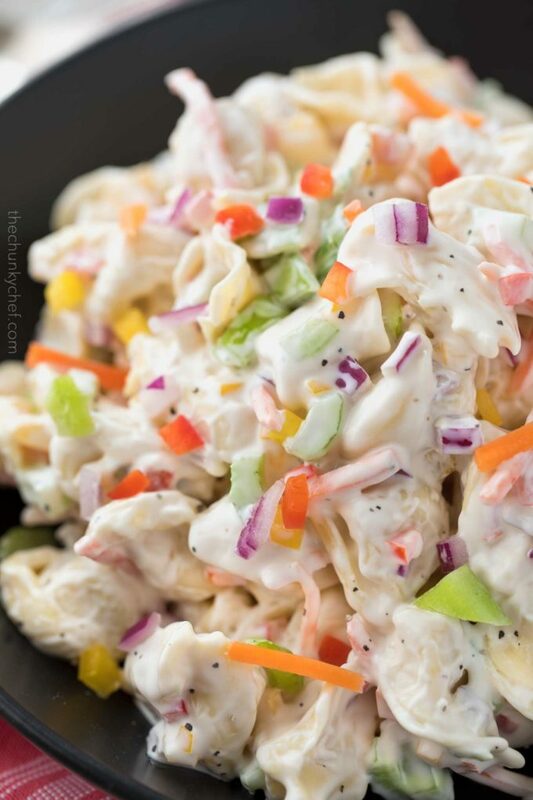 Here in the Midwest, macaroni salad is tossed with an ultra creamy sweet and tangy dressing. It’s also made with traditional elbow macaroni. This pasta salad uses the same dressing, but with some fun change-ups with the add-ins and pasta itself! It’s generally a pasta salad made with tortellini pasta (usually the cheese-filled variety). Most tortellini salads are made with an oil-based dressing, but my version uses a creamy dressing that goes so well with the cheese tortellini! Use tortellini instead of dried elbow shaped pasta. The tortellini adds a beautiful savory contrast to the sweet dressing, as well as added protein. Use whichever colorful vegetables you prefer. For the red I use red bell pepper, orange is shredded carrots, yellow is yellow bell pepper, green is celery, and purple is red onion. Tomatoes, hard-boiled eggs, chopped broccoli florets, etc could be substituted for the coordinating color. The trick to getting the dressing consistency just right is to toss the hot, drained pasta with apple cider vinegar and let it cool for 10-20 minutes. 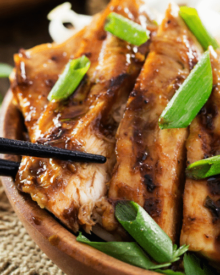 This allows the finished dish to have a beautiful tang, with no risk of curdling the dressing with the vinegar. As you’re mixing the pasta with the dressing, it may seem like there’s way too much dressing… but as it chills in the refrigerator, it will thicken up beautifully. Speaking of chilling, it’s essential here. All the flavors will really marry together and the dressing thickens! For little pops of extra color, reserve a teaspoon or two of all the vegetables and sprinkle them over the top of the salad before serving. This pasta salad will last about 3-5 days in the refrigerator, kept in an airtight container. Mixing bowls – I love these bowls, and they even have lids so you don’t need to cover them with anything while the salad is chilling! Want to try this Tortellini Pasta Salad? 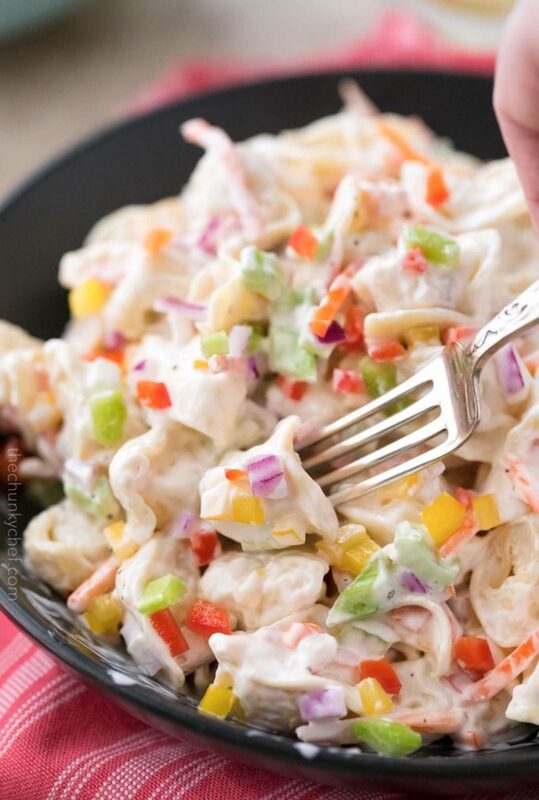 Creamy pasta salad made with tortellini, colorful vegetables and a sweet and tangy dressing! Boil tortellini according to package directions and drain well in a colander. Transfer pasta to a large mixing bowl and toss with apple cider vinegar. Let cool 10-20 minutes. While pasta is cooling, in another mixing bowl, add mayo, milk, sugar, salt and pepper. Whisk to combine. Pour dressing over tortellini pasta and toss gently to combine. Stir in all but 1 tsp EACH of all the vegetables (red pepper, carrots, yellow pepper, celery and red onion). Cover and chill in refrigerator for at least 1-2 hours. Before serving, stir salad and sprinkle with remaining vegetables. Can be made a day in advance and kept refrigerated. After chilling for long periods of time, if pasta seems dry, stir in a splash or two of milk and/or a tablespoon of mayo. Do you have the nutrition value for the Creamy tortellini pasta salad? I must try this one. I need to try this salad immediately, it looks so good! I would love to try this! Looks so creamy and delicious! Your pictures are gorgeous!! This tortellini salad is right up my alley! 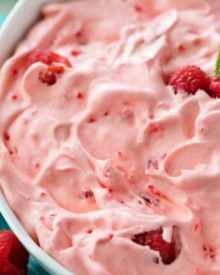 Yum, looks so creamy and delicious! What a great summer salad! Love that it is packed with veggies! This has all the colors of the rainbow! I know I would come home with an empty bowl. We have a big event planned this weekend and I now have the perfect dish to take. Love this!